Interstate 345 overlays the southernmost section of U.S. 75 along the Central Expressway between Downtown and Cle Elum in Dallas. The route is unmarked, with U.S. 75 signed alone on the mostly elevated route between IH 30 / IH 45 and State Spur 366 (Woodall Rogers Freeway). Interstate 345 was built in conjunction with the Interstate 45 / Central Expressway project in the 1970s.2 The designation was approved by AASHTO on June 30, 1970. 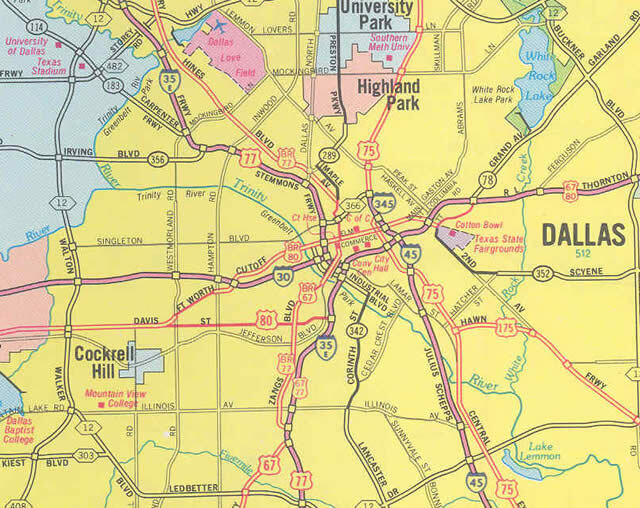 This map inset from the 1986 Texas Official Map shows the routing of unsigned Interstate 345 between Interstate 30 and the Woodall Rodgers Freeway (Texas Spur 366). TXDOT contacted local map companies and requested them not display Interstate 345 on their maps as to avoid confusion for motorists. A two-wye interchange (Exit 286A) joins the north end of unmarked IH 345 with Woodall Rodgers Freeway (SS 366) west to the Stemmons Freeway and the Margaret Hunt Hill Bridge to the Trinity Groves neighborhood. U.S. 75 exit numbers commence at succeeding off-ramp for Hall Street and Lemmon Avenue. Photo taken by Justin Cozart (09/16/03). U.S. 75 advances southward below grade along the Central Expressway toward the exchange with State Spur 366 (Woodall Rodgers Freeway) west to IH 35E (Stemmons Freeway) and the unmarked beginning of IH 345. Photo taken 09/05/09. Pull through signs refer to the remainder of U.S. 75 south along the IH 345 portion of the Central Expressway as IH 45. North Hall Street spans the freeway at the two-lane off-ramp (Exit 1A) for SS 366 west to IH 35E. Photo taken 09/05/09. The Woodall Rodgers Freeway (unsigned SS 366) runs along the north side of Downtown Dallas, linking IH 345 and U.S. 75 with IH 35E (Stemmons Freeway) and the Margaret Hunt Hill Bridge crossing the Trinity River. Photo taken 09/05/09. 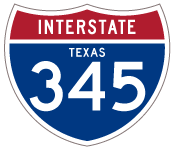 Interstate 345 begins and accompanies U.S. 75 (Central Expressway) 1.5 miles to the four-level interchange with IH 30. Photo taken 09/05/09. The initial sign for IH 30 appears along IH 345 & U.S. 75 (Central Expressway) southbound within the exchange connecting with SS 366 (Woodall Rodgers Freeway) west. Photo taken 09/05/09. The Central Expressway navigates through an elevated S-curve between Downtown and Deep Ellum, connecting with IH 30 at a symmetrical stack interchange (Exit 284A). Photo taken 09/05/09. Interstate 45 begins on the top deck of the systems interchange with IH 30 and the Central Expressway. Two lanes curve east onto IH 30 toward Mesquite and Texarkana. Photo taken 09/05/09. An end sign for IH 45 precedes the multi-level interchange with IH 30 and U.S. 75 / IH 345 (Central Expressway) by a half mile. U.S. 75 extends the IH 45 freeway northward to Colbert, Oklahoma, serving the communities of McKinney, Sherman and Denison, Texas. Photo taken by Justin Cozart (12/02). Ramps from IH 35E (Stemmons Freeway) to IH 30 east form a collector distributor roadway ahead of Hotel Street. The c/d roadway extends east to Cesar Chavez Boulevard and a separate distributor roadway for IH 45/345 and U.S. 75. Photo taken by Eric Stuve (12/16/02). The IH 30 mainline continues east 1.25 miles to the distributor roadway for IH 45 south and IH 345/U.S. 75 north (Exit 46). Photo taken by Eric Stuve (12/16/02). Akard Street crosses over IH 30 a half mile ahead of Exit 46 to IH 45/345. The succeeding interchange joins the outer roadways with the older Central Expressway (since renamed to Cesar Chavez Boulevard), which is the former route of U.S. 75. Photo taken by Eric Stuve (12/16/02). Ramps from IH 30 east, parallel Griffin Street and the outer R.L Thornton Freeway roadway converge along the distributor roadway (Exit 46) for IH 45 and the Central Expressway. Photo taken by Eric Stuve (12/16/02). Exit 46 splits into ramps for unsigned IH 345 & U.S. 75 (Central Expressway) north toward McKinney and Interstate 45 south to Houston and Galveston. Photo taken by Eric Stuve (12/16/02). One mile ahead of the four-level interchange (Exit 47B) with the Central Expressway north and Interstate 45 south on IH 30 westbound. Photo taken by Chris Patriarca (06/20/03). Exit 47B splits into a single lane ramp for IH 45 south to southeast Dallas and Hutchins and IH 345/U.S. 75 north to Downtown and Belmont Park. Photo taken by Chris Patriarca (06/20/03). “From Anywhere to Everywhere: The Development of the Interstate Highway System in Texas” http://tti.tamu.edu/interstate_anniversary/white_paper/ by Penny Beaumont, Rhonda Brinkmann, David Ellis, Chris Pourteau, and Brandon V. Webb, Texas Transportation Institute, page 34.